"Murad is campaigning to try to get the world to notice, and do something." 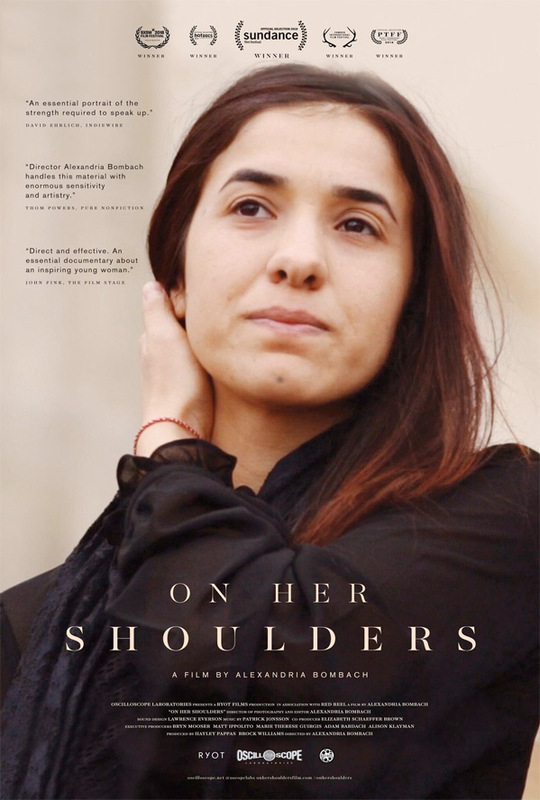 Oscilloscope Labs has debuted the official trailer for a documentary titled On Her Shoulders, which premiered at the Sundance Film Festival earlier this year and won the US Documentary Directing Award. The film is even more relevant now because its subject, young activist and genocide survivor Nadia Murad, just won the Nobel Peace Prize with Denis Mukwege. After surviving the 2014 genocide of the Yazidis in Northern Iraq and escaping sexual slavery at the hands of ISIS, 23-year-old Nadia Murad gave a testimony before the U.N. Security Council that was heard around the world. Nadia suddenly became the face and voice of the Yazidis. Despite longing for a normal life away from the spotlight, she takes on the exhausting role of an activist in hopes of halting the ongoing genocide. This seems like a powerful look at how hard it is to speak up and keep living your life. Twenty-three-year-old Nadia Murad's life is a dizzying array of exhausting undertakings—from giving testimony before the U.N. to visiting refugee camps to soul-bearing media interviews and one-on-one meetings with top government officials. With deep compassion and a formal precision and elegance that matches Nadia's calm and steely demeanor, filmmaker Alexandria Bombach follows this strong-willed young woman, who survived the 2014 genocide of the Yazidis in Northern Iraq and escaped the hands of ISIS to become a relentless beacon of hope for her people, even when at times she longs to lay aside this monumental burden and simply have an ordinary life. On Her Shoulders is directed by doc filmmaker Alexandria Bombach, her second feature-length documentary after Frame by Frame previously. This premiered at the Sundance Film Festival this year, and has played at many other festivals. Oscilloscope Labs will release On Her Shoulders in select US theaters starting on October 19th later this month. Interested?